Nantucket’s new community hospital, the first new medical facility on the island in more than 60 years, opened for patient care on February 20, 2019. Our new hospital will enhance access, safety and privacy for patients, allowing us to better serve the island community with a broad range of medical services. We are proud that Nantucket will set a national standard for small community hospitals by offering expanded outpatient services with capacity for inpatient care and surgery, giving patients a central location for all their healthcare needs, including primary, emergency, and specialty care, as well as diagnostic testing. 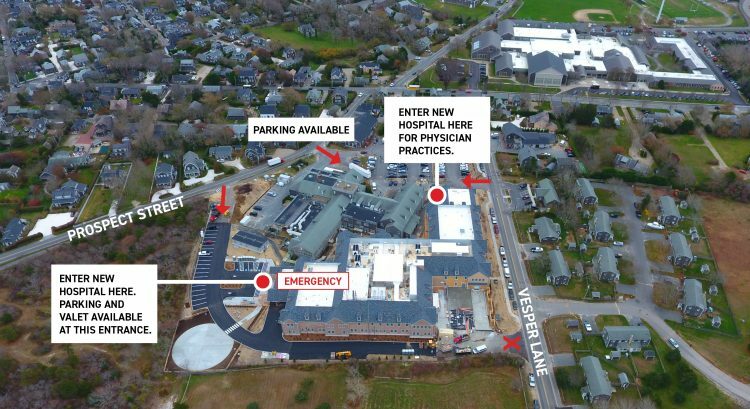 Thanks to an unprecedented $120 million capital campaign, the largest in Nantucket history, the new hospital was built entirely through private donations, debt-free, and with no taxpayer dollars. Patients should use the Emergency Department entrance for all hospital services with the exception of doctor appointments. So if you are coming for a lab test, surgery, infusion, dialysis, or imaging including x-rays, ultrasounds, or mammography, please use the Emergency Department entrance off Prospect Street and take advantage of the free valet service. Please use the physician clinics entrance for doctor appointments only. The Nantucket Cottage Medical Group is the group physician practice within the new hospital. In this new model, we co-locate most of our primary care doctors and many of our specialty physicians under one roof. This will provide patients with more convenient access to the island’s medical providers, create one-stop-shopping for most of your medical needs, while enhancing collaboration among the medical staff and the continuity of care between primary and specialty providers. So, there will be one place to go for most of your doctor appointments, and one phone number to call: 508-825-1000. While the reception staff may be different from visit to visit, your doctor will remain your doctor. Dr. Tim Lepore’s office will remain in the Anderson Building on the hospital campus with the same phone number, 508-228-4846. Other private practices, including Briarpatch Pediatrics, will be re-located to the NCH medical offices at 4 Bartlett Road. Please click here for a complete list of other private practice locations. The Anderson Building Clinic will remain open for same- and next-day appointments (508-825-1066). When the new facility opens to patients, the final phase of the project will commence including the demolition of the old hospital and the completion of the final site work, parking area, and landscaping. This phase is expected to be completed by June 2019. Following the completion of the $89 million new hospital project, Nantucket Cottage Hospital will use the remaining capital campaign funds to complete its campus with new staff housing units to help address the island’s affordable housing crisis and fulfill the promise of the new facility. At a time when small, rural hospitals are shutting down across the country at an alarming rate, Nantucket Cottage Hospital has galvanized the support of the island community to secure its future. As the former whaling capital of the world, the entire island of Nantucket is designated as an historic district, and the new hospital required the approval of the island’s elected architectural review board. The design of the facility balances Nantucket’s architectural heritage and sensibility with the modern healthcare services provided inside its walls. With lessons learned from hurricanes like Katrina and Sandy, the new Nantucket Cottage Hospital will set a new standard for resiliency in community hospitals. The facility will meet hurricane design specifications established by Miami Dade County, some of the strictest in the country, allowing it to withstand winds in excess of 185 mph. In addition to other resilient design features, all of the building’s mechanical systems have been installed on the roof, rather than in a basement. The new hospital will also be certified as a LEED Gold v4 building, a standard that will provide synergies within the building systems, solutions for optimizing performance, and allow NCH to achieve better environmental and economic outcomes from the new facility. Nantucket Cottage Hospital is an affiliate of Massachusetts General Hospital and a member of Partners Healthcare. In designing and building the island’s new hospital, the goal was to provide the best of both worlds to Nantucket residents and visitors: the expertise and resources of a world-class academic medical center paired with the comfort, tradition, and familiarity of the island’s beloved community hospital. Our new hospital will transform the patient experience by enhancing privacy and safety, increasing access to our providers, and incorporating new technology throughout the building. It also creates the foundation for our future by providing new opportunities to expand services and attract the best clinicians. The new Nantucket Cottage Hospital is an investment in the future of the island, and will create a foundation for the community’s health and wellness for the next 50-plus years. By designing the hospital for the way medicine is practiced today, and designing in the flexibility to support the medicine of tomorrow, the hospital will be able to meet current healthcare room size codes (which only one room does now) as well as incorporate modern technology for the HVAC, electrical, and plumbing systems. The upgraded and efficient infrastructure in a new building will lower our operating costs, making our organization financially sound, and allowing us to invest more resources in programs and services instead of our outdated and aging facility. Donate and join the hundreds of islanders who will be commemorated in the new building on our donor wall.